What is the Mappers' Guild? The Mappers' Guild has been running for more than a year with participation from around 40 mappers. 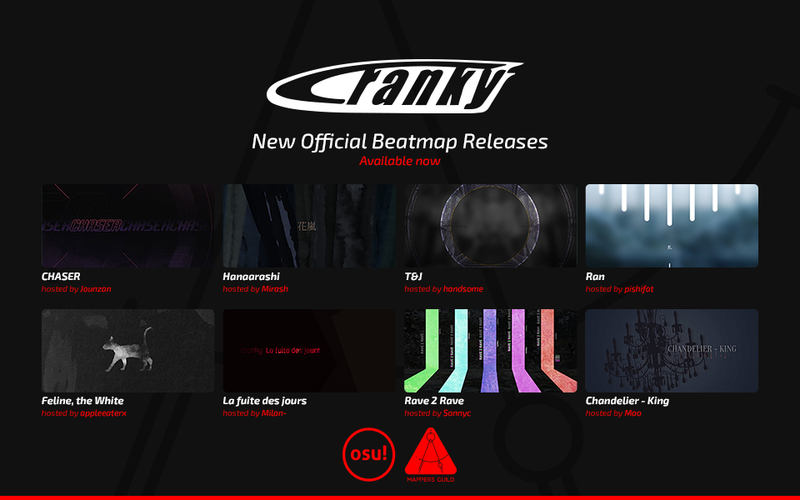 Through this website and automated functionality, we're now able to bring in more mappers (potentially including you)! How does the Mappers' Guild work? In addition to making maps of music licensed by osu!, the Mappers' Guild has similaritiess to any other MMO-style guild. We support subgroups of mappers (parties) working together to create map packs for specifically assigned artists or other content (quests). By creating maps and participating in the mapping process, a user can earn points and level up to receive rewards! Quests reward mappers for following certain requirements when creating their featured artist beatmaps. For example, a quest's objective could be "create 5 mapsets of songs from Camellia", necessitating a party of 5-10 members and completion within 3 months. If a party accepts and completes the quest according to its rules, each party member will be rewarded point bonuses. If a party drops the quest, they will lose points. Parties are groups of mappers who register to complete quests together. Mappers may join one party at a time and each party may undertake one quest at a time. Special quests require higher ranks to participate in. For a party to qualify as a higher rank, at least half of its members must be the required rank or higher. Quests and parties are rewarding ways to get involved with the Mappers' Guild, however our main goal is to produce maps for osu! 's featured artists, and that can be done however you prefer! Why join the Mappers' Guild? By creating maps through the Mappers' Guild that abide by our rules, you can earn rewards! *Difficulty points scale according to a map's drain time, with the midpoint being around 2.5 minutes. Collab difficulties split points evenly between users. Maps created through the Mappers’ Guild will be used in medals and occasionally as promotional material. Most quests will have their own themed medal, while other unrelated mapsets will be grouped under a general Mappers’ Guild medal. Special quests involving unannounced featured artists will additionally be used as promotional material in news posts when applicable. How do I join the Mappers' Guild? If you have 3 or more ranked maps, you can join the Mappers' Guild by clicking the button below and authenticating through your osu! login. If you don't meet the requirements, come back when you have! Additionally, we recommend reading the frequently asked questions page to better understand what you may be doing as a member of the Mappers' Guild.